I love chocolate especially when I can sink my teeth into it. Nothing screams chocolate more than Truffles! Before Border’s Books closed my daughter and I would frequent there to purchase books, magazines, videos, etc. At the checkout line we could never resist the Lindt Truffles – purchase 3 for a special price. My favorites were the raspberry and dark chocolate. Truffles are quite pricey for just one small orb but that one can satisfy me for hours. I use to think there was special magic in creating them, but they’re the simplest and most elegant chocolate treat to make. Of course, the ingredients you use can take them from ordinary to extraordinary! Purchasing the very best chocolates is key but of course not essential. Even a bag of chocolate chips will do the trick but for a special occasion I recommend going all out to find the smoothest tasting chocolates. I decided to play around recently with my creations using vinegar’s infused with various fruits from a store that recently opened nearby called DiOliva’s. To my surprise my Chocolate Raspberry Balsamic Truffles tasted exactly like the Lindt ones I’ve had in the past. With my recipe yielding about 18-20 truffles I can afford to serve these at parties – like Super Bowl coming up, or even to give as gifts for Valentine’s Day. If you’re a fan of chocolate you’ll have fun making these truffles. Be creative and add your favorite flavors. Some of mine are the Balsamic Vinegar’s I’ve used at DiOliva’s like: Raspberry, Strawberry, Fig, Blueberry and even the white Cranberry Walnut Balsamic. What are you waiting for? Give these a whirl! Who says your Super Bowl party has to be all fried grub food? Add some decadent sweets to the table and create batches to give for teachers gifts, and gifts to family and friends for Valentine’s Day. Everyone is sure to love them – that is of course if they love chocolate! Bring cream to boil in heavy duty saucepan. Remove from heat. Add chocolate shavings or chips and whisk until melted and smooth. Whisk in Raspberry Balsamic Vinegar. Pour into medium bowl. Cover and chill until firm - 2-3 hours. Line a baking sheet with parchment, foil or waxed paper. Using a teaspoon place a rounded scoop onto prepared baking sheet. Freeze until firm, about 45 minutes. Place sifted cocoa in a bowl. Roll truffles between hands into rounds. Roll gently in cocoa. If you don’t want your truffles flavored, simply replace the flavored vinegar’s with pure vanilla extract. Truffles can be rolled in chopped nuts, coconut, sprinkles or gold dust, or whatever suits you. They are so lovely and I can imagine how decadent! They are decadent and addicting. I hope you’ll try them. Chocolate truffles are great! They do seem as if they’d be complicated to make, but they’re so simple. I don’t believe I’ve ever had one with balsamic vinegar before. I do have some flavored varieties on hand, so maybe I’ll convince Mrs K R to give these a whirl (she’s the chocolate maven in our household). Good stuff – thanks. I decided to add the balsamic vinegar just to see how they would turn out and they were spot on the ones I’ve paid $$$ for at the chocolate stores. Now I can save my money and make them myself and in upteen flavors. I hope you try them. 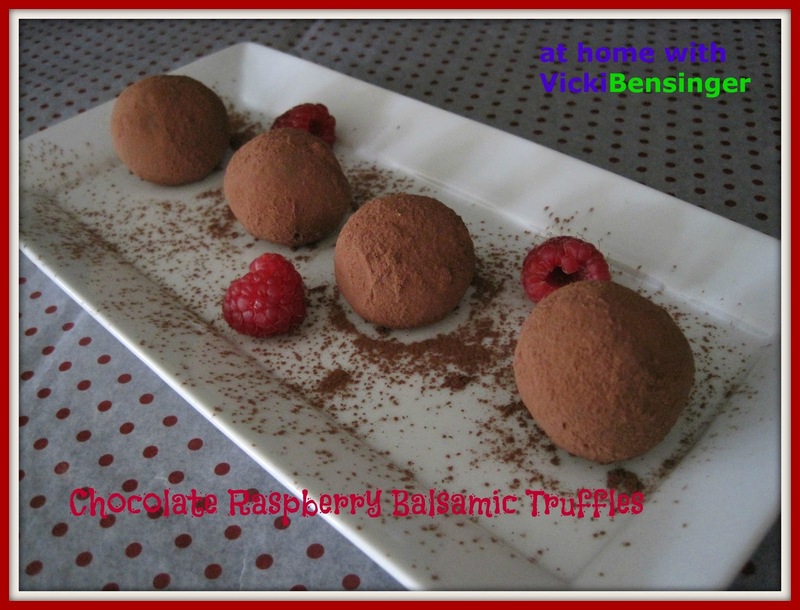 Hi Vicki, this truffles sure look awesome and addictive. I’m a huge fan of chocolate and truffles. YUM YUM! Have a great week ahead. Hope you have fully recover. Take care. Thanks for the well wishes Amelia. I hate to say this but I ended up catching the flu from my husband so I’m still recovering. This has been the worst way to start off 2013 but I’ve been hibernating until the weekend when I need to go out. As for these truffles I hope you try them they are wonderful. Plus they’re fun and easy to make! We have, I’ll need to make another batch soon! All I had to do was read the name of these truffles and my mouthwatering was watering! YUM! I hope you try them, they’re yummy! I can think of few combinations better than chocolate and raspberry. A perfect Valentine treat. I hope you try them in whatever is your favorite flavor. They’re heavenly! I love truffles and decided I’d see how they would turn out using my Raspberry Balsamic and I couldn’t believe the flavor. They literally taste just like the Lindt ones I’ve tried. They must use balsamic in them because it’s a dead ringer for the store bought ones. Now the flavors are endless! Vinegar in chocolate? It sounds interesting, though. Just want to take a bite into one immediately! Thanks for sharing I think I have to try these. I know it sounds odd but I put it on fruit and love it so I thought it could be the perfect marriage and it was. These are so delicious they taste as good if not better than the expensive ones you purchase at the chocolate stores only they’re a fraction of the price. This Valentine’s Day I’ll be making up a variety pack of flavors to share with those near and dear to me. Vicki, I’m with you on the best chocolate treats, especially around Valentines (we need an excuse after the festive season, right?) and these are just irresistible with the addictive acidic touch. I didn’t recognize the acidic flavor only the hint of raspberry and the other flavors I tried. I was pleasantly surprised at how delicious and high quality they tasted. I hope you try them. I love balsamic with chocolate. Its wine-y quality just compliments chocolate so well. What a perfect treat for somebody special on Valentine’s Day. Thank you so much, Vicki, for visiting my blog and for your comment. I’m so happy to meet you and am off now to browse through your posts. I see some very delicious dishes here. Vicki,I’m a confessed chocoholic and the combination of flavors in your recipe sounds amazing, congrats! Yummy Vicki, these look wonderful. It is amazing that such a simple treat could be so irresistibly delicious! I too love a good truffle! Especially when the balance of flavors is just right. 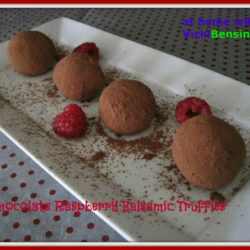 I’m interested in this Raspberry Balsamic Vinegar alone but these truffles are even better!!! I know I won’t stop eating just one (more like the enter batch will go to my tummy!). I’d love to try these truffles! We have a similar store here called Oro di Oliva that sells wonderful infused oils and vinegars. What a wonderful way to put them to use! I have their Blackberry Ginger infused vinegar in my pantry right now that would be delicious with chocolate. Who can resist anything with chocolate especially at this time of the year.